Full disclosure – I have a lot of fears. Being a NODA Intern has already forced me to face a lot of situations that make me uncomfortable. There was one fear, however, that I did not expect to have to encounter – heights. And yet, here I am, sweating profusely, trying not to look down, sitting at the edge of a wooden plank, moments away from falling into the space below, clutching a harness that’s secured me to a zipline that stretches outward and ends at a net on the other side of the room that’s supposed to catch me – how did I get here, exactly? It all started when UAH’s Director of Student Life, Nikki, and her Graduate Assistant, Shannon, asked if I could meet with them one day after orientation activities were over. The subject of the meeting was the upcoming Association of Campus (ACE) Entertainment retreat. Even though I am a NODA intern with orientation, Nikki and Shannon had heard about my experience in late night programming at the University of Florida, and wanted to know if I would be interested in helping facilitate the ACE retreat. I was very excited to have been invited, and after getting the okay from my supervisor, I accepted their invitation. 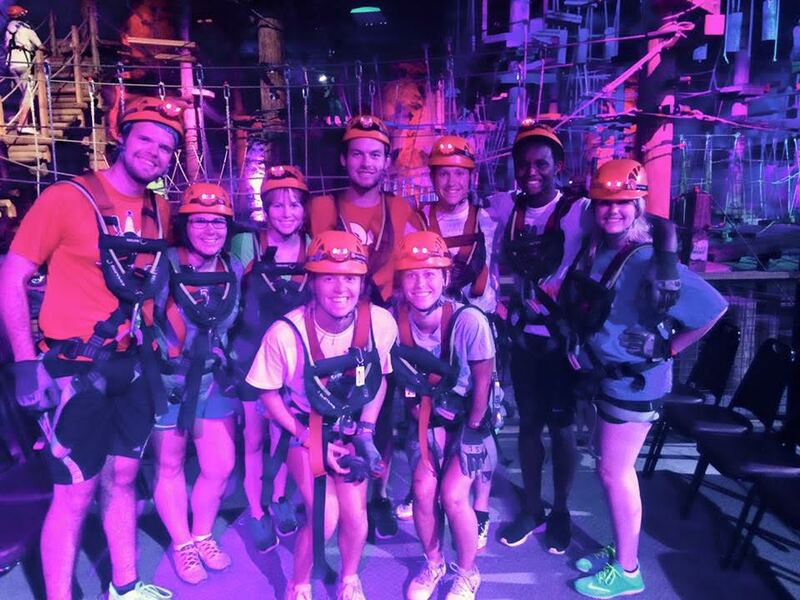 What I didn’t fully realize was that part of the retreat was completing a high ropes course with 78 different obstacles inside of a cave. 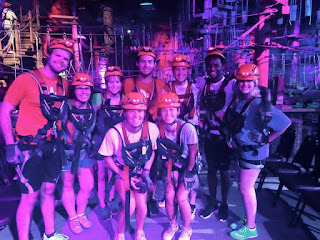 Mega Caverns in Louisville, KY, was to be our team building activity, and everyone was participating – students and staff. I put on a brave face and smiled sheepishly as the attendant strapped me in to my harness and helmet. It didn’t look so bad after all – from the ground anyway. Once we had been given instructions on how to properly attach the harnesses to the wires throughout the course, it was our groups’ turn to embark on our journey. Some members of the group immediately secured themselves and zipped off to the highest obstacles without so much as a “Bye, Felicia.” Others were a little more hesitant, but soon found their footing on the ropes, beams, and planks. Then there was me – absolutely frozen with terror, only moving forward with the knowledge that other people were waiting behind me. Navigating through the course, I soon found myself at a crossroad. I could go right, tackle an obstacle I wasn’t fond of, and go around the lower level of the course for the fifth time. Or I could go left… and up… to the platform. Once I was on the platform, the only way I could get down was the zipline. Even though I was terrified, I knew I had to do the zipline at the end. I had to. I knew if I left that course without doing it, I would be disappointed with myself. So, when I finally got up the nerve to try, I began the ascent to the top of the platform. To get to the top, there was a rock wall that connected the lower platform, to the upper platform. People gathered below me, waiting patiently for their turn as I slowly inched my way up the rock. Ah, the kindness of strangers. Once at the top, it was time to face the line. It didn’t seem so manageable from here, on this tiny piece of wood, twenty or so feet in the air. I chickened out once and let Nikki go before me, watching her zip down the line with ease. I studied her as she caught the net, shimmied her way to the latter, and climbed back down to the ground. Zip, net, latter. Zip, net, latter. I began chanting the routine to myself, just in case I lost all memory from fear during the free fall. I did not want to forget the steps. Then was my turn. There I sat on the platform, taking shaky breaths, wondering what in the world I was doing. I said a quick prayer, and jumped into the air. For that first second of free fall, I was stricken with terror. But when I sat back into my harness, I was surprised at how strong it was. Once I realized how supported my body actually was, I smiled as I zipped down the line. My whole body was floating through the air, and yet it felt totally secure and safe in the harness. I landed on the net as gracefully as possible, and marveled at what had just happened as a I made my decent down the latter. Security is a funny thing. We’re taught to think that to keep us safe, we need some type of thing to keep our lives secure – locks, passcodes, ADT, Life Alert, the alarm on your car that really only serves a purpose when you can’t remember where you parked. What if security isn’t really achieved by some type of software or hardware? What if the word “security” should be replaced with the word “support?” It was the support from other people that made it safe to continue on to the zip line, and it was support from my harness – a simple system of belts, medal, and clips – that made it safe to enjoy the ride. As I stood panting and sweaty on the ground, receiving pats on the back from my students, colleagues, and friends for facing my fear, I learned a lesson that I can apply to my daily life. As I go forward, my safety is not guaranteed by anything or anyone, and I will face many dangerous and scary situations. It is the support, however, from the people I choose to surround myself with that will help me successfully navigate those situations.